As the listing says, this upper duplex apartment overlooks “the leafy treetops of Park Slope.” Located at 127 Park Place, a lovely brownstone and treelined block of the neighborhood, you do get a good view of Brooklyn from the windows. The interior isn’t too bad either, with high and detailed ceilings, fireplaces, the original wood floors, and plenty of other original details. There’s no outdoor space, but there is potential to build out a roof deck up top. 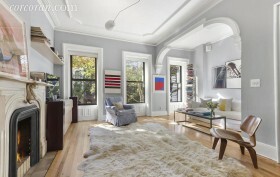 So how much does it cost to buy up half a historic townhouse? For three bedrooms and two-and-a-half bathrooms, the price tag comes in at $2.19 million. It’s high, but not too far off given that full townhouses in the neighborhood can go for $4 million.